Normally being a night owl doesn't bother me. I can slave over my manuscript until midnight and still get at least seven hours of sleep. It's all good. But then again, most nights I don't usually get pulled from sleep and given a near heart attack. We're moving. Our house is sold (yay!) and we're closing on the new house in less than three weeks (also yay!). The packing has commenced. Yesterday afternoon, the hubby and I cleaned out our under-the-stairs storage space in the basement. This kicked up quite a bit of dust. In case you didn't know, smoke alarms possess a deep hatred for dust. 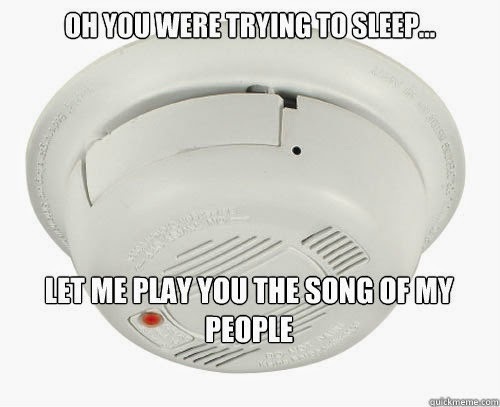 Of course, it waited until the smoke-alarm-secret-oath time of 4am to give a "nuisance alarm." Whoever decided the word "nuisance" was appropriate, should be locked in a room and subjected to 85 decibels of ear-piercing screeching x6. Because as it turns out, if your house has an interconnected system of wired-in smoke alarms, when one goes off, they ALL GO OFF. More like a WHAT THE HELL IS GOING ON alarm. The upstairs alarms are in three locations: the master bedroom, the kids' bedroom, and the hall. Which means they're all approximately three feet away from each other. I've been to rock concerts that were quieter. I'm freaking out, the kids are freaking out. My poor husband, who is transitioning from days off to graveyard shift has only been asleep for an hour and is scrambling to get a chair and hit the silence button. Finally we get it shut off. The silence lasted for a whole 45 seconds before they all started screeching again, only to shut off on their own a couple seconds later. There's no smoke. No signs of any sort of emergency. After another round of on-and-off, my husband unplugs the hall detector. IT KEEPS BUZZING. I'm yelling over the noise to take the back-up battery out, he does and, finally, they all shut off and stay off. It looked like we found the culprit, so we calmed down the kids, I stayed in their room and my husband went back to bed. About a minute later they all go off AGAIN. At this point, no detector is safe. They all get unplugged and their batteries ripped out (serves them right). This is when my husband notices the basement alarm in front of the storage space has a red light instead of a green light. I Google the manual and it turns out the red light signals the trip alarm. Thankfully, this confirms the dust theory and I can stop envisioning our attic smoldering silently above our heads. I don't care if automated houses are going to take over the world someday. I'm saving up for a smoke detector that talks to me when it goes off and tells me where the alarm is coming from. Preferably in a soothing British accent.